Figure 1b: Gigantic plumes surround NGC 1084. 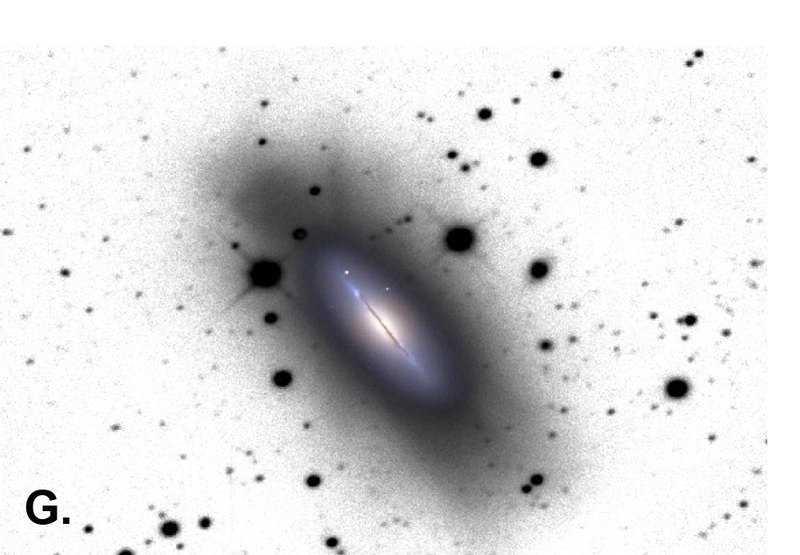 Our Blackbird Observatory image of nearby galaxy NGC 1084 (Fig.1b) also displays three giant disconnected plumes of similar width extending by a large galactocentric distance ( 30 kpc) into its halo. Two of these tails emerge in opposite directions from the inner region of the galaxy while a third one appears completely disconnected. These features were first detected after a close visual inspection of SDSS images. However, it remains difficult to assert if this collection of arcing features is associated with one or several different merger events. Figure 1c: This image of NGC 4216 provides evidence of ongoing tidal disruption. In addition to the remains of presumably long disrupted companions, our data also captured the ongoing tidal disruption of satellite galaxies that are still visible, seen as long tails extending from the progenitor satellite. Perhaps, the most conspicuous examples can be seen in the image of NGC 4216 (Fig. 1c). This panoramic view of the galaxy shows two satellites with distinct cores and extremely long tails that extend several kiloparsecs into the principal galaxy's halo. The host galaxy also displays a prominent thick disk with several pillars arising from it. The nature of these features (tidal debris or ram pressure signatures) will be discussed at length in a future paper later this year. Figure 1d: Surrounded by a shell of debris, and pierced by a narrow jet-like structure, NGC 4651 was one of the most spectacular galaxies in the pilot survey. Among the most conspicuous features found in our survey are coherent structures that resemble an open umbrella extending tens of kiloparsecs into the host spiral's halo. These spectacular formations are often located on both sides of the principal galaxy and display long narrow shafts that terminate in a giant partial shell of debris. 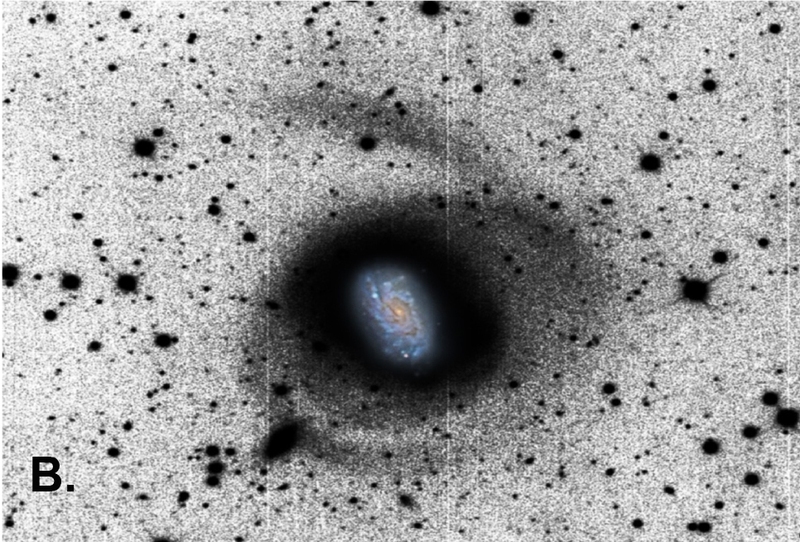 The most remarkable example so far detected is NGC 4651, shown in Figure 1d. This is the brightest tidal stream detected in our pilot survey (visible even in very short exposure times). The jet-like feature is strikingly coherent and narrow. This feature was previously reported by Vorontsov-Velyaminov (1959) but never interpreted as a stellar tidal stream. Moreover, our deep image shows an additional spectacular crescent shaped shell surrounding the east side of the galaxy that corresponds to the apocenter of the dwarf galaxy. Interestingly, a possible second arc on the western side of the galaxy can also be seen in this image. 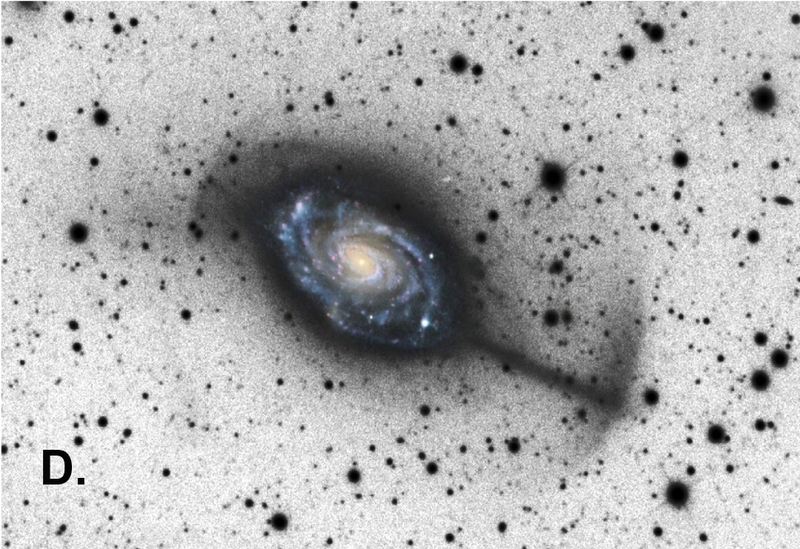 This structure is less obvious because it is partially hidden by the galaxy's disk. 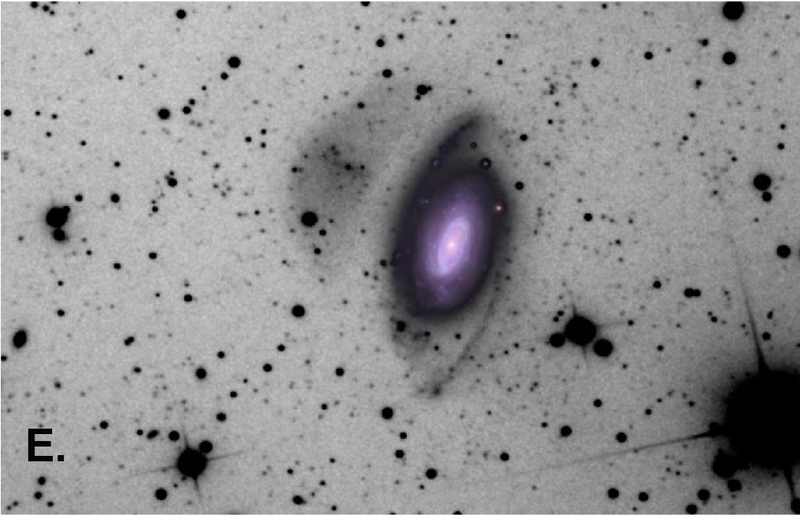 This suggests we are observing a moderately inclined structure projected into the halo of NGC 4651 (Fig. 1d). Figure 1e: The diffuse structure surrounding NGC 7531 may be a debris shell from a tidally disrupted former satellite companion. The giant, diffuse, cloudlike structure seen in the halo of NGC 7531 (Fig. 1e) was first reported by Buta (1987) from an inspection of photographic plates. This author classified it as a possible dwarf companion (named A2311.8­4353) in orbit about this spiral. The report also offered some insights about tidal disruption. Our deeper images clearly reveal the actual shape and extension of this intriguing feature including the presence of small scale sub structuring. Its size is comparable to the disk of the host galaxy. We suspect it might be the shell component of an umbrella­ like structure, like that discussed above. Figure 1h: NGC1055 displays a box shaped inner halo with a number of brighter spikes. 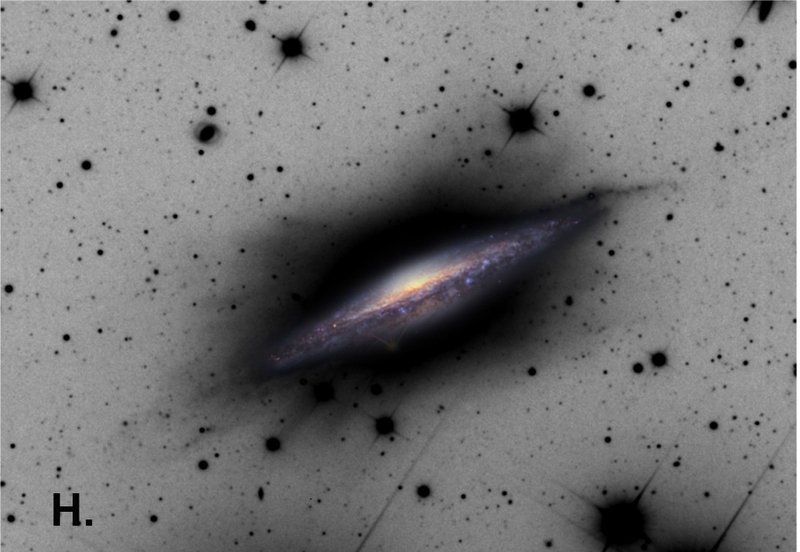 Figure 1g: NGC 5866 displayed the most striking set of spikes detected in the pilor survey. 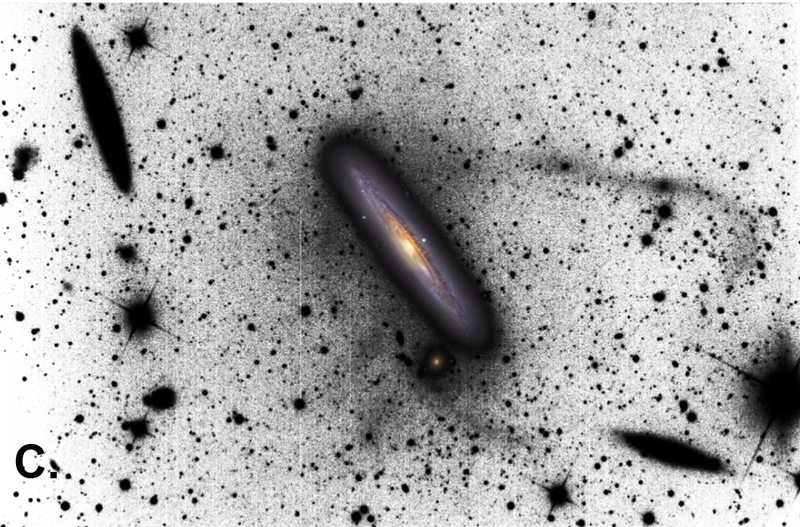 Our images have also revealed the presence of smooth large ­scale structures that contain coherent substructures spread above and below the plane of several galaxies. These examples (Fig. 1g and 1h) are excellent candidates for systems with mixed-type stream ensembles, although alternate origins cannot be rejected. Perhaps the most remarkable system is NGC 1055 (Fig. 1h). This galaxy displays a clear box shaped inner halo sprinkled with a plethora of coherent spikes that seem to emerge from the galaxy's disk. The most striking examples of spike like structures that have been detected in our survey thus far are those associated with NGC 5866 (Fig. 1g). In this system, a collimated structure extends 8 kpc into the galactic halo. This galaxy also displays more substructure in its smooth component, such as a wedge of material in the plane of the disk on its eastern side. The morphology of this disk extension is consistent with the remnants of a recent merger event. Figure 1f: A spherical debris shell evidences the ancient accretion of a former satellite galaxy by NGC3521. The diffuse structure detected around NGC 3521 (Fig. 1f) contains discernible substructure, such as an almost spherical cloud of debris visible on its eastern side and a large more elongated cloud on its western side. Both structures may represent debris shells belonging to an umbrella like structure, as seen in the image of NGC 4651 (Fig. 1d), but their fuzzier aspect could suggest that they were accreted much farther in the past. Remarkably, the diverse morphologies of stellar tidal features detected in our pilot data nearly span the range of morphologies seen in cosmologically motivated simulations. Therefore, they already represent the most comprehensive evidence matching and supporting the detailed hierarchical formation scenario predictions for galaxies similar to the Milky Way. 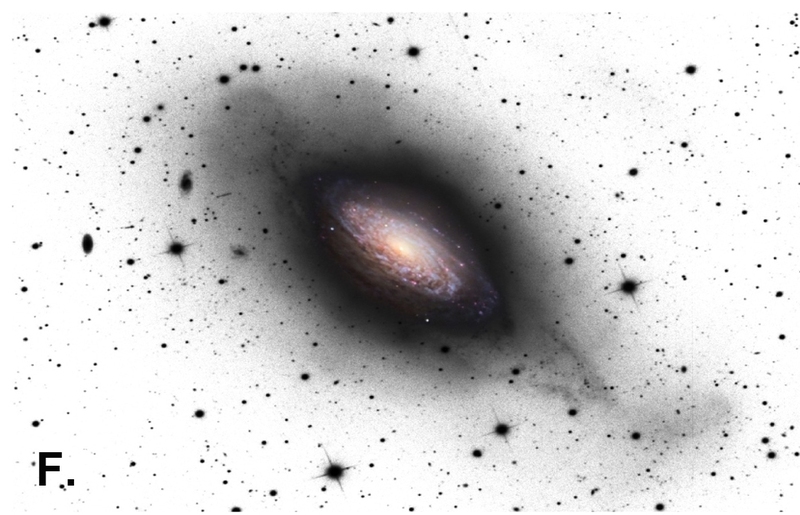 Encouraged by this pilot survey, we have embarked on the first systematic search for stellar tidal streams in a complete, volume limited sample of spiral galaxies up to 15 Mpc (i.e., the Local Volume). This will result in the first comprehensive census (presence or absence) of stellar stream structures within the Local Volume and it will enable meaningful statistical comparisons with cosmological simulations. The frequency of streams, their stellar populations and their morphologies will help reveal the nature of the progenitors and lend insights into the underlying structure and gravitational potential of the massive dark matter halos in which they reside. This will thereby offer a unique opportunity to study the apparently still dramatic last stages of galactic assembly in the Local Universe. In this regard, the survey will be complementary to (and directly inform the interpretation of) local galactic `archaeological' data from M31 and the Milky Way.